Are you looking for a good LAN Party case for LAN Parties or Gaming Events? If yes then I am going to help you find one. LAN Parties are very fun events where you can compete with real competitors and also show off your powerful or fancy gaming rigs. These LAN Parties require you to bring your computer or gaming case to the event for participation or to play there. This means portability is a major concern when building a gaming computer for LAN Party and you will need a compact, strong and lightweight computer case that is easy to carry and move around from one place to another. These are some computer cases that designed solely for LAN parties, and some of the possesses all the required qualities for use in LAN Parties. So, here I am going to list down the best LAN Party PC cases for LAN Parties or LAN gaming events. What to Look in a Case for LAN Parties? Here are the most important things that should be present in a LAN Party case. Handle – A carry handle is one of the most important things to look for in a case for LAN parties. This is because you have to carry your case along with you and a handle makes it very convenient to move it around from one place to another. Compact & Lightweight – Portability is also an important factor for a LAN Party case, and a compact and light weight case is easier for anyone to carry and move around. So always look for a small form factor (SFF) case for LAN Parties. Sturdy – The case should also be strong enough so that it can handle the abuse when you move around it so much for the gaming events or LAN parties. 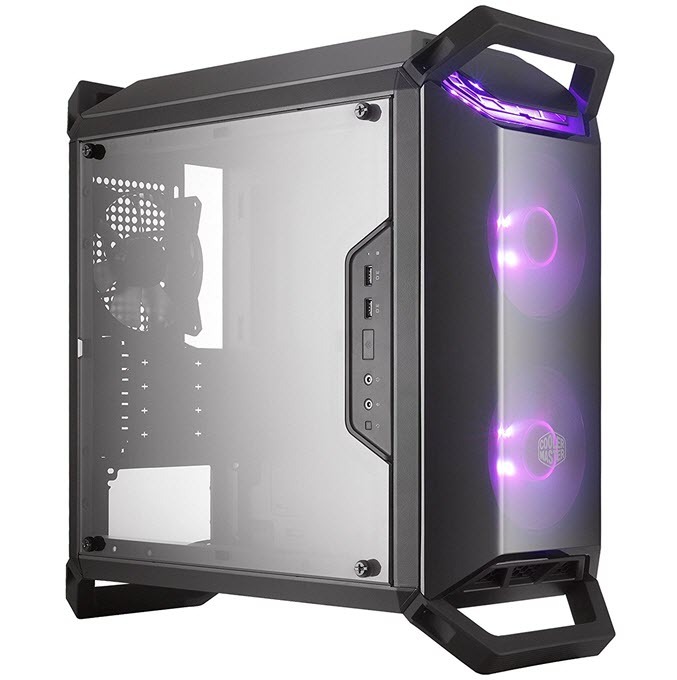 Spacious – Along with compact design, the case should also offer enough space to fit all your major gaming components inside it, that includes a powerful graphics card, Aftermarket CPU cooler, Liquid CPU cooler and Radiators. 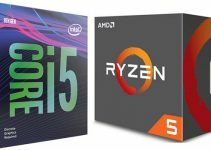 This is because for gaming competitions you do want to build a relatively powerful gaming rig so that it can handle everything with ease that you can throw at it. Some of the popular LAN Party games for PC include Left for Dead 2, Starcraft, Quake III Arena, Call of Duty 4: Modern Warfare, League of Legends, Dota 2, Unreal Tournament, CS:GO, Age of Empires 3, Battlefield 4, GTA 2, Halo, Serious Sam: The First Encounter, Overwatch, FlatOut 2, Arma 3 and many other eSports titles. Here are the best compact cases that you can use to build a gaming computer for LAN Party use. Cooler Master Scout 2 Advanced is a superior version of the older Cooler Master Scout 2 which is one of the most popular LAN party cases around. This is an excellent LAN Party case because it is compact, portable and big enough to support up to ATX sized motherboards. The case comes with strong steel reinforced carrying handles with rubber coating that allows you to move it around from one place to another comfortably. It has plenty of fan mount points at every side and it comes included with two 120mm Red LED case fans (1200 RPM) at front and one 120mm black fan (17dBA) at rear. On the top front panel, you can find two USB 3.0 ports, two USB 2.0 ports, Audio ports and a LED Fan switch to ON/OFF the LEDs of the two front fans. The front I/O ports are hidden in a sliding cover for extra protection. This case supports 399mm long graphics card, 162mm tall CPU coolers and a 120mm radiator for Liquid CPU Coolers. Other features include tool less ODD installation, dust filters and bottom mounted PSU. The case looks very stylish and is solidly built. You can build a pretty powerful LAN party PC using this portable PC case, but it may seem a little big and heavy for some users because it is a mid-tower case. Highly Recommended by me. 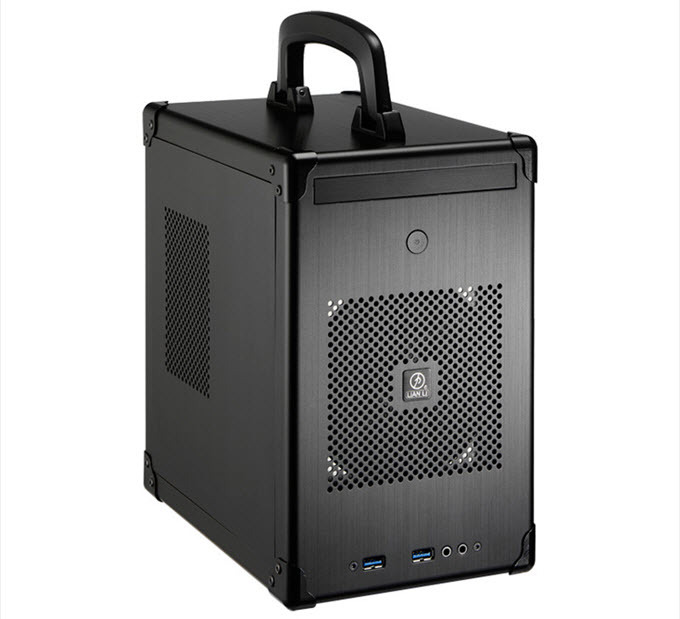 LIAN PC-TU100 is also another very popular compact case for building a LAN Party PC. This LAN case looks like a briefcase and has got a briefcase like handle on the top which is makes it very easy to carry with only one hand from one location to another. This LAN case supports Min-DTX and Mini-ITX motherboards only. This is undoubtedly one of the smallest cases for building a LAN party PC and is highly portable. For cooling, the case allows you to include a 120mm fan (optional) at front and has got two USB 3.0 ports and audio ports on the bottom front panel. This case only fits low profile graphics cards or small form factor (SFF) graphics cards that are up to 193mm in length, low profile CPU coolers up to 60mm in length and SFX power supply. It does lack 3.5” drive bay but can support two 2.5” drives and one 5.25” inch slim ODD. The side panel can be released simply by pushing the lever and you do not need any tools for it. This is a great case for building an eSports gaming rig for LAN party events because these games do not require high-end components, and you can build a powerful mid-range LAN party build using this compact mini-ITX case. The build quality of this case is also very good. So, if portability is a number one concern for you then you cannot avoid this excellent mobile and transportable case. Cooler Master HAF XB EVO is a cube case that can serve as a LAN Party case, HTPC case and also as a Test Bench case. This LAN Box case supports up to ATX sized motherboards and has got enough space for all high-end components including graphics card. Even with its compact size, the case allows fan mount points at front, top, rear and it comes with two 120mm XtraFlo fans pre-installed. On the front panel, you will get two dual USB 3.0 ports, audio ports and X-dock bays for 3.5”/2.5” hard drives to easily remove and install them on-the go. The case comes with rigid carry handles on the sides for transportation. The case supports high-end graphics cards up to 334mm in length, 180mm tall CPU coolers which means it can support Cooler Master Hyper 212 EVO easily and 240mm Radiator for AIO liquid coolers. It also has removable motherboard tray for easy installation and slide-out dust filters. So, if you are looking for a case that is low on height but can be slightly wider then this is the case for you to build a high-performance LAN party computer. This is a compact Open Air PC case that supports Mini-ITX motherboards. This small form factor case takes its design from a motorcycle chassis. 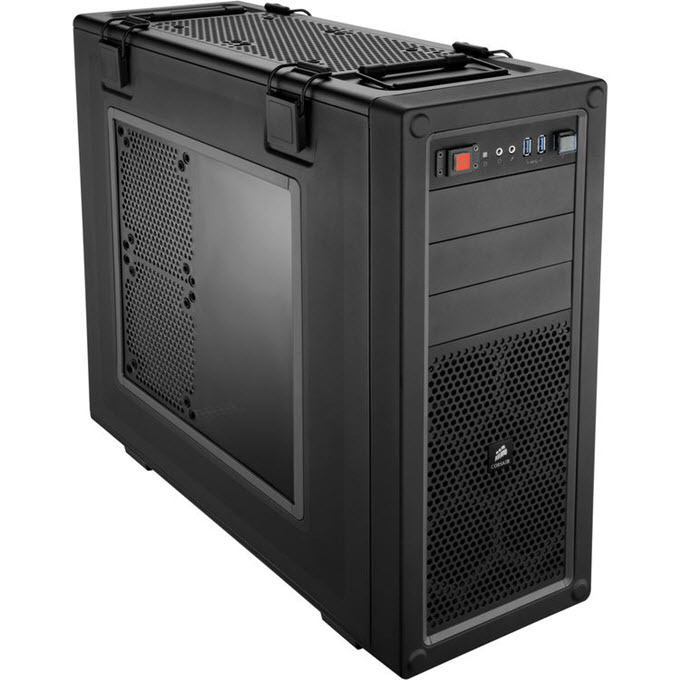 This is a pretty strong case and because of its open frame design it offers great airflow and ventilation. It is made of aluminum pipes or tubes that makes its strong and lightweight. On the front you will find two USB 3.0 ports and audio ports and on sides you will get two tinted tempered glass panels. This case can fit 340mm long high-end graphics cards, CPU Coolers with 165mm in height, 240mm Radiator and a standard PSU. This is a pretty unique case and can easily turn heads at LAN Parties. Other features include shock proof design, tool free drive installation, cable routing and rubber bumpers. The case is slightly on the expensive side but it is really worth it. 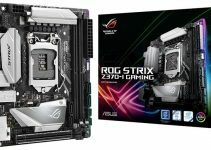 Overall a very unique, attractive, feature rich and a sturdy case for building a LAN Party Gaming PC. Cooler Master MasterBox Q300P is a newer case from Cooler Master and it is built specifically for the LAN Party use. This is a mini-tower case that is portable, futuristic and comes with lots of cool features that you won’t find in other LAN Party case or any case. The case supports up to Micro-ATX sized motherboards and has got four removable handles at all four corners that makes it very easy to carry around from one place to another. For cooling, it comes with two 120mm RGB LED fans at front and one 120mm non-LED fan at rear. The color of the RGB fans can be changed or controlled using the RGB controller that comes with this case. It has got modular I/O panel that can be adjusted to six different locations on both sides of the body at front, top and bottom. The I/O panel consists of two USB 3.0 ports and Audio ports. 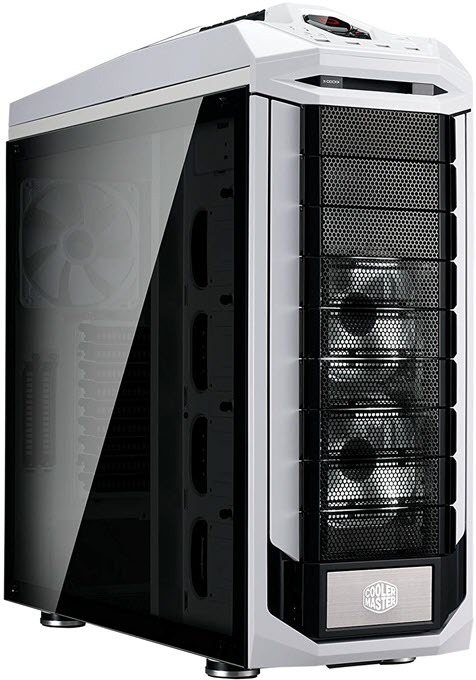 The case offers enough room and supports 360mm long graphics cards, 157mm tall CPU coolers and 240mm Radiators. Other features include bottom mounted PSU, cable routing, transparent side panel and horizontal / vertical positioning. This is a great compact LAN party case with amazing features and is very affordable too. Highly Recommended by me. BitFenix Prodigy M is a small form factor micro-ATX case that can used to build a decent gaming PC for LAN Parties. 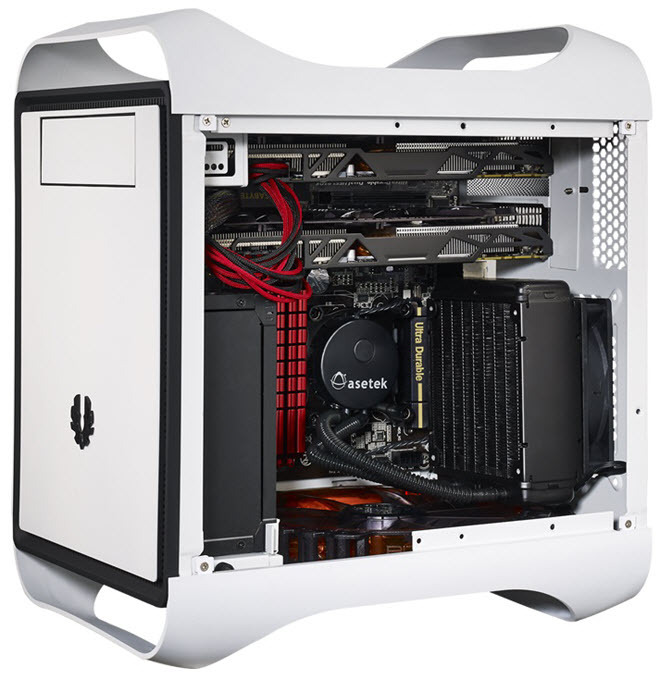 This case supports up to micro-ATX motherboards and has got composite carry handles on top and bottom part. For cooling the case comes with one 120mm fan at bottom but you can also install fans at top and rear also. The front side panel of this mATX case consists of two USB 3.0 ports and audio ports. The case is big enough to support 320mm long high-end graphics cards, 160mm tall CPU coolers and 240mm Radiators. It also supports one 5.25” ODD bay which is removable. The case has good build quality and you can build a relatively powerful and compact LAN Party PC using this portable case from BitFenix. Recommended by me. This is a low profile case or slim Mini-ITX case for building a small form factor PC for work, console killer PC or a HTPC. This slim form factor case comes with a large carry handle and you can carry the case from one place to another with one hand, just like a briefcase. For cooling, the case has got vents at rear and one sides. The front I/O ports include two USB 3.0 ports and audio ports. The case can support 330mm long graphics cards but with 121mm width restriction. You have to use a low-profile CPU cooler with this slim case as it allows only 58mm clearance for CPU coolers. There is no support for radiator or liquid cooling coolers and the case only supports SFX & SFX-L PSUs. The case can be place in both horizontal and vertical orientation which is an added advantage. Well, you cannot build a fancy PC using this case but you can build a decent mid-range LAN Party gaming computer for eSports gaming. So, if you are looking for slim case that is easy to carry around for LAN Parties then you can give this case a try. Here are some cases with handles that are bigger in size but can be used for LAN Parties. 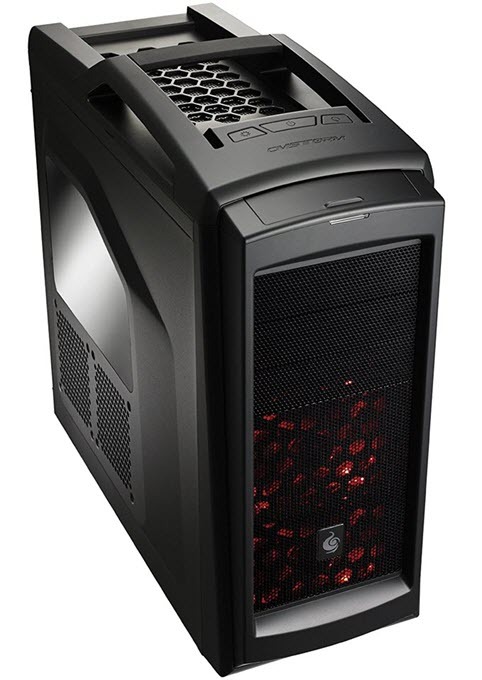 Corsair Vengeance C70 is strong and sturdy case that is built to dominate LAN Parties. This is a mid-tower case and supports up to E-ATX sized motherboards. The case comes with strong carry handles for easy transportation from one place to another. This is a very spacious LAN Party case and has got superior ventilation and airfloe. For cooling it comes with two 120mm fans in mid and one 120mm fan at rear. You can optionally install extra seven fans at top, front, bottom and on side panels. On the front panel you will get two USB 3.0 ports and audio ports. This case can support high-end graphics cards up to 320mm in length, Tall CPU Coolers up to 170mm in height and 280mm Radiators. The side panels of this case are very easy to remove without any tools using the quick release latches. Other features include removable dust filters, cable management, tool free drive installation and transparent side panel. Compatible Case Corsair Liquid Coolers include H55, H60, H75, H80i, H90, H100i, H105, H110. Overall a very solidly built case to build a powerful LAN Part gaming computer. Highly recommended by me. 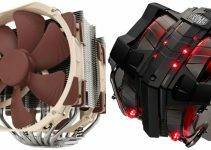 Cooler Master Stryker SE is a big case and the biggest case in this list. 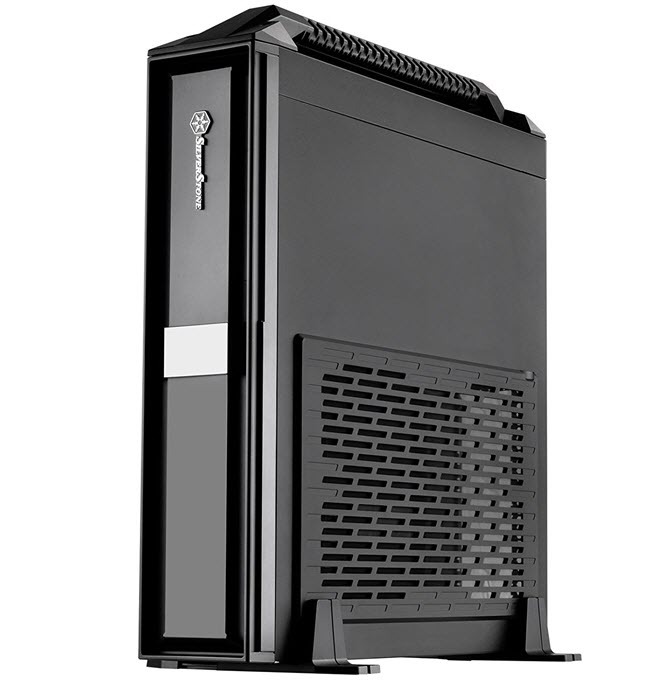 It is a full tower gaming case that offers loads of space and supports up to XL-ATX motherboards. For transportation the case comes with an ultra-strong carrying handle that has rubber coating over it. For cooling and airflow, it comes with two 120mm white LED fans at front, one 200mm fan at top and one 140mm fan at rear panel. You can optionally install more fans at other panels too for increasing the airflow. On the front top panel, you will find two USB 3.0 ports, two USB 2.0 ports and a fan controller to adjust fan speeds according to your needs. You also get a 2.5″ SDD hotswap X-dock on the front panel. 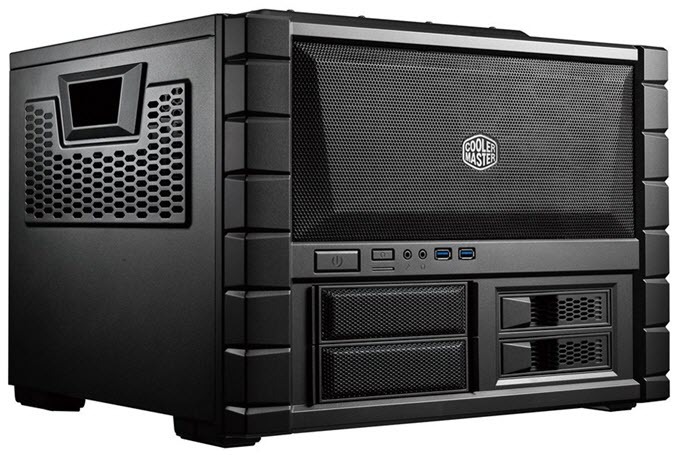 The case can support 322mm long graphics cards, 186mm tall CPU coolers and 280mm Radiators. Other features include tempered glass side panel, vertical mounting of graphics card, dust filters, cable management, tool free drive installation, two modular hard drive cages, Internal Tool Box and Storm Guard Bracket. This case may not appeal to most of the LAN Party gamers because of its relatively big size and heavier weight, but if you are an enthusiast and want to build a high-end LAN Party PC then you should definitely get this case. 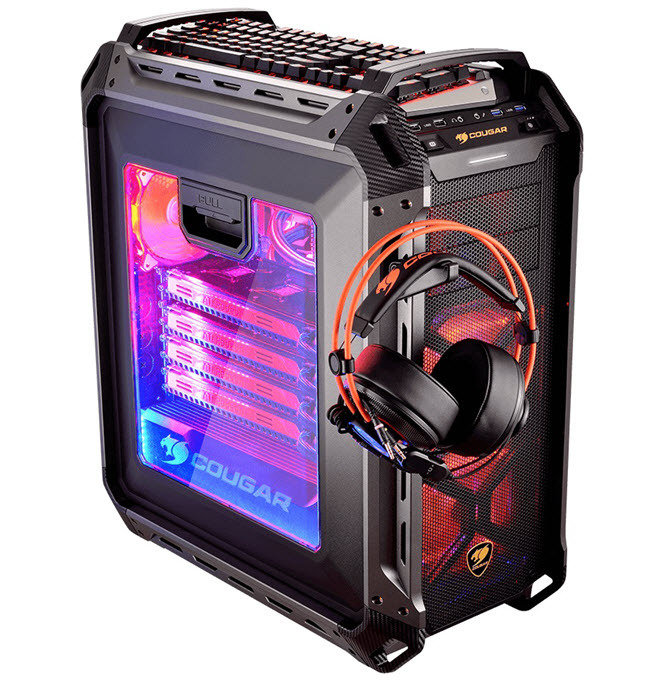 COUGAR PANZER MAX Full Tower Gaming Case is one of the best cases that you can get to build full fledged high-end gaming PC for LAN parties. This gaming case has got the looks, style, features and plenty of space for all your high-end gaming components. The case can support up to E-ATX sized motherboards and includes two 5.25” drive bays for ODD. For cooling, and airflow it has enough fan mount points at all locations and it comes pre-installed with two 120mm fans at front and one 120mm fan at bottom. It also includes a fan controller that can be used to control the speed of fans according to your needs i.e. for silent operation or performance. The front panel of the case consists of two USB 3.0 and USB 2.0 ports, Audio ports and Fan controller speed switch. There are two handles present on the top of the case that can support up to 35KG of weight. The case comes with nifty features such as keyboard tray on top and headphone hook. The side panel is transparent and the case features tool-less opening and removal of all covers which comes in very handy. The case supports high-end graphics cards up to 390mm in length and CPU coolers up to 170mm in height. It is a water-cooling ready case and supports two 360mm radiators on top and front. Other features include cable management and tool free drive installation. So, if are looking for a well built trendy and feature rich LAN party case (with sturdy handles) for building a powerful LAN party gaming PC then this case is definitely a steal. Highly Recommended by me. Here are some other good gaming computer cases that come with carry handle. You can check them out too as they are very good feature rich PC cases, and can also be used for building a LAN party gaming rig. At the end I would like to say that here I have listed all the best LAN Party cases that are portable, strong and all of them comes with a carry handle. Some of them very compact and some of them are a little big and thus offers lots of space for all your high-end gaming components. You can choose any of the above mentioned LAN Party cases according to your needs or requirements. If you have any doubts or queries regarding them, then please leave a comment below. 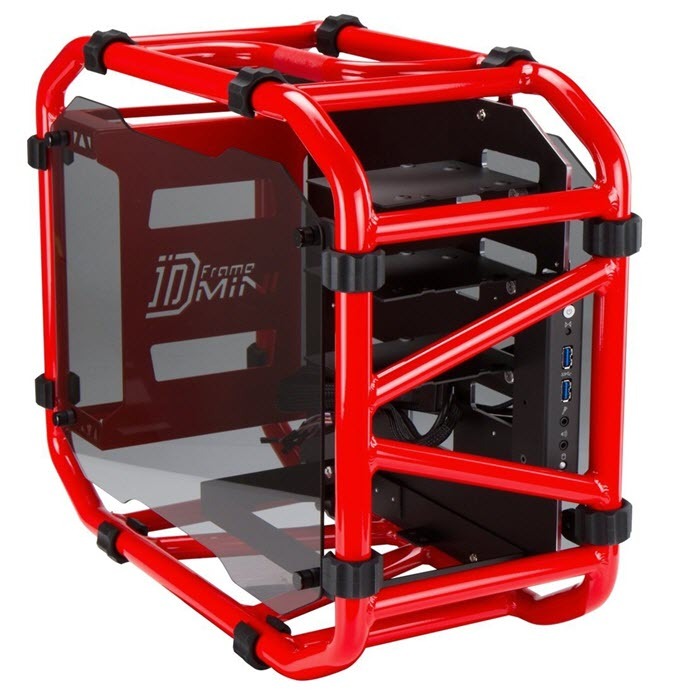 I think this “In Win D-Frame Mini Open Frame Chassis” is not legal. Because of the missing shielding. Radio amateurs like to call the radio authority for interference. What is currently a cheap recommendation for a small portable housing? For “mini” graphics cards. But not low-profile! “Low profile is weak and rare.” Mini “(shorter) is common and has normal performance. A cheap alternative to the PC-TU100? I would suggest Cooler Master MasterBox Q300P Mini-Tower Case.